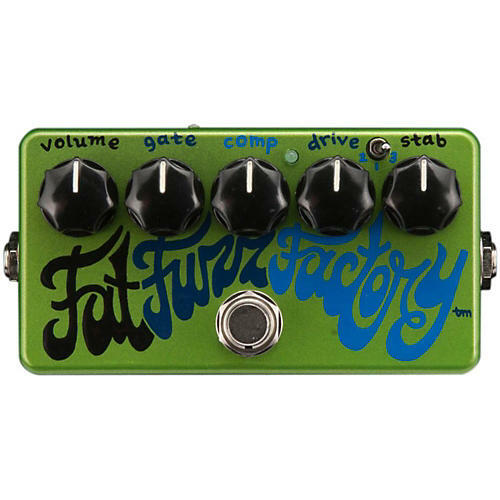 A take on ZVex's original company flag ship Fuzz Factory, the Fat Fuzz Factory features a sub switch that opens the pedal up to an astounding new bottom end. This means the pedal can oscillate at much lower registers, giving it some very interesting thunder broom synth qualities. Based on field reports, this new fatness lends itself particularly well to the bass guitar, and rips equally well on guitar. Although the five knobs are named for the parameters over which they seem to have the most control, they are controls for various operating levels and biases, and basically shape you a personalized fuzz. Comp: Adds attack characteristic when turned to left, which gets softer to right, and suddenly pinches tone when all the way right. Also use to tune in fat feedbacky fuzz, if you're that kind. Lower the Stability and see what happens to this control. Stab: Use all the way right. Do not attempt to adjust this control below 2:00, unless you like your fuzz soft and squishy. Use to control feedback pitch. Order today and create a sound that is uniquely yours.